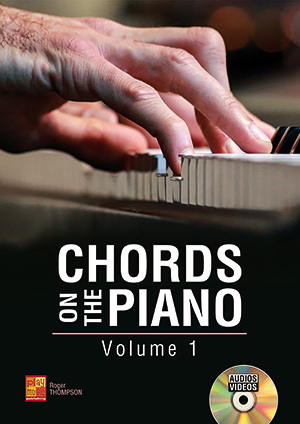 Chords on the Piano - Volume 1 (PIANO, Coursebooks, Roger Thompson). This coursebook explains in a clear and practical way how chords should be handled. This first volume, dedicated to the principal three- and four-tone major, minor and seventh (maj7, 7, m7 and dim7) chords, contains numerous pedagogically valuable, meticulously precise and nonetheless melodic examples, which will lead you through harmony, chord progressions, accompanying and composing. By practicing the examples proposed in this coursebook, you will gradually familiarize yourself with the basics of harmony and will discover step by step the astoundingly malleable world of chords. You will thus approach the theme in an empirical way, and by doing so, you will understand how individual components should be put together to form a well-made musical piece. The accompanying data disk (with mp3 audios and mp4 videos) provides demonstration videos of all the examples played on the piano, as well as numerous audio recordings, which will allow you to play along to backing tracks specially designed for each of them.